Office depot calculator AT-814. Calculator with 12-digit LCD display. Operates on battery and / or solar energy. Colour: silver, grey. Recycling Label This system allows for you to get the longest dated and genuine products available. 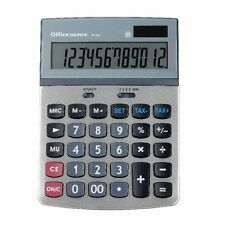 Office Depot calculator AT-812E. Desktop calculator with an 8-digit LCD display. Operates on battery and / or solar energy. Weight: 94 grams. Colour: silver, grey. Recycling Label This system allows for you to get the longest dated and genuine products available. Office Depot calculator AT-812T. Desktop calculator with an 8-digit LCD display. Operates on battery and / or solar energy. Colour: silver, grey. Recycling Label This system allows for you to get the longest dated and genuine products available. 12-digit Desktop Calculator. Calculator TypeDesk. of Digits12. Decimal SelectYes. 12 digit led display Time and date display Professional functions and much more. Battery (included) and solar powered . Bought a while ago but never used, instructions included. Fast and easy to use currency conversion function. 8-digit Desktop Calculator. Picture is for illustration purposes only. Extra large keys. Otherwise your item will be despatched automatically. Ativa AT-812E Desktop Calculator. Condition is New. Dispatched with Royal Mail 1st Class. Value for money compact pocket calculator. Handy flip wallet makes it ideal for your pocket. Battery power lets you use it anywhere. Protection Wallet. Ativa - Multi-Function Financial Calculator AT-10 - New still sealed! Ativa Financial Calculator - Multi Function.New still sealed! 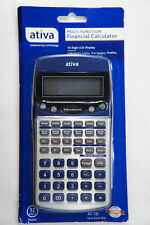 ATIVA FINANCIAL CALCULATOR MODEL AT-10 SILVER & BLUE NEW! 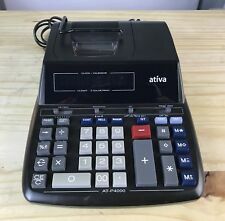 This Ativa Financial Calculator Model AT-10 is in very good condition. The item you will receive is exactly as pictured. Ativa Teal Green Calculator Expandable Ruler Solar Powered. Condition is Used. Shipped with USPS First Class Package. I bought this at Office Depot a few months ago because it looked cool but I haven’t really used it. I’ve only turned it on and used it for maybe 5 minutes at most during its entire life. It’s in very good condition. All the buttons still work and so does the screen. Ruler is intact. It’s a wonderful calculator and ruler hybrid but I just don’t use it and would like for someone else to have it. Also features replay and answer functions. In total, there are 8 keys. Display includes 10 digits with a 2-digit exponent — on 2 lines. Automatically shuts off when not in use to save battery power. Scientific Calculator. -10 2 digit, dot matrix LCD display with scientific notation. -User Guide. 2-Line Display. Never open! -Fraction & mixed number calculations. -Kick stand. -Color coded keypad. For sale is a ATIVA 2-LINE DUAL POWER DISPLAY SCIENTIFIC CALCULATOR AT-36 TESTED AND WORKS GREAT. 2 Office Depot® Brand OD02M Standard Desktop Calculators & 2 Ativa KC-421 12-digit Calculators. Condition is Used. Shipped with USPS First Class Package (2 to 3 business days). U p for sale is a Ativa AT-36 scientific calculator. It has been tested and works great. Ativa AT-P500 1-Color, Hand Held Printing Calculator ~Free Shipping~ New! New Ativa AT-P500 1-Color, Hand Held Printing Calculator. If you are dissatisfied in any way, give us the chance to make things right. USED Ativa AT-10 Financial Calculator W/sliding hard cover/stand. Works Great! Automatically shuts off when not in use to save battery power. The device is in really nice condition and works great! Easy-to-read 2-line display with 8 characters per line. Ativa AT-P500 1-Color Handheld Printing Calculator. Works with 4AA Batteries(not included). There are many life left for the ink. Machine only, no paper and AC adaptor. Item has been tested to be in good working condition. Paper in it is included with this sale. Sold 'AS IS'. What you see in the picture is the item we have for sale. If it is not in picture it is not included with this sale.